Tim Marquitz sent me this book around the time it was released. Tim knows to anticipate an honest review from me. On GoodReads, his was not a ‘rounded up’ four-star, it’s an “I can’t quite give it 5-stars” review. Although this is book 5 in the series, there are a lot of ‘first times’ to mention. This was Tyson Mauermann’s editorial debut. For those who don’t know Tyson, he is ‘the’ book reviewer for Speculative Book Review– and here I have an opportunity to critique his work– heh-heh. The editing was 5-star quality in Beyond the Veil. (Now Tyson, for such nice words, I expect a 5-star review for my next book. Insert cheesy smile here.) In all seriousness, the editing was nearly flawless––a good editor makes a great author look perfect. Tim’s money was well spent. This is also the first Demon Squad book to have Carter Reid’s masterful art for its cover. This cover screams what will be found inside––lots of action is coming––enough that Frank should hide and save his bullets. Frank looks grittier than ever—the cover fits the book. Again, Tim’s money—well spent. Here is a first for me too. Normally, I avoid self-published books because the quality is often-times amateurish. Shot from the hip and usually without proper editing, self-published books are frequently nightmarish. Of course there are exceptions. Tim Marquitz is one of them but Tim is not new to the publishing world. Due to the grim nature of his series, I think he has made a wise decision in leaving traditional publishing. Tim’s expertise is shown by the pros who’ve gathered to help produce a book at this high of a quality. Now, what is inside the book? Beyond the Veil is either the best written, or the best edited in the series to date, perhaps both. This is the 5th book in the Demon Squad Series, a series that began with Armageddon Bound. If you love Dark Fantasy, stop reading this review, go buy the first book. The story changes dramatically in Beyond the Veil, and I’m not going into the back story – we are five books deep. In fact, I’m going to avoid speaking of the plot entirely. If you’ve read book four, you know where book five needs to go. Let’s talk about characterization. As we expect with Frank’s narration, this story is rich with sarcasm and colorful metaphors. This was one of the attractions that caught me in Armageddon Bound, and it is consistent throughout each book. Sadly, yet understandably, as Tim’s writing abilities have sharpened, so Frank’s lewdness has also been shaved away. Frank’s inability to keep it in his pants (or at least his hand) was a character flaw that burned Frank as a memorable anti-hero. Here in book five, Frank loves boobies as much as ever––he’s just stopped slobbering so much. Frank has grown considerably. Frank is an anti-hero. I don’t normally read books where the hero is a borderline villain. We see more of Frank’s anti-hero behavior in this book, more so than in any of the prior books. Still, he possesses enough conscience that we can forgive him and keep cheering him forward. His actions are quite ‘uncool’ in the very beginning of this book, but I will leave it for you to decide if Frank is worthy of your forgiveness. I’d probably done the same thing if given the same circumstances. Luckily, my wife probably won’t get nabbed by extra-dimensional fugitives on the run from God and Satan, but if it does happen, rest assured, I’ll follow Frank’s lead. The imaginative quality of this story is right on par with earlier books in the series. Tim’s vision of magic is easily malleable and its use is enjoyable to read. His delivery is visual––as is expected by us who’ve traveled this deep into the story. So with all this great stuff to say, why didn’t I give it 5-stars. I enjoyed this book greatly, but in the end, it just didn’t hit me like ‘At the Gates’ and ‘Armageddon Bound.’ My connection to this story wasn’t as strong. Most readers will disagree, but I thought there was too much action. I was loving the interaction between Frank and Longinus—and then AMBUSH! Or, Frank is having great dialogue with an alien woman, learning more about the world, and DRAGON ATTACK! Frank is sniffing out clues and “IT’S A TRAP!” (Shamelessly, I quote Admiral Akbar, and that particular scene was very important to the plot.) Some readers will see the constant action as a good thing, especially younger readers who don’t appreciate well-written and long-winded dialogues. They will disagree with this critique the strongest. Don’t read too far into what I’ve said. 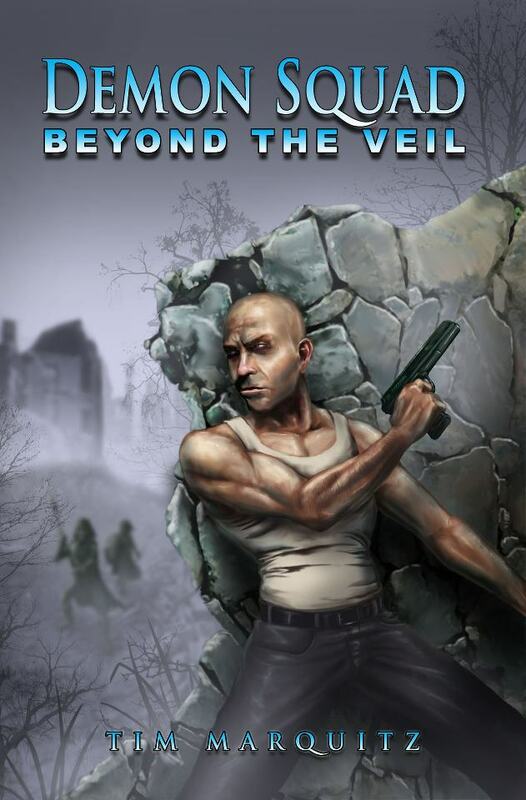 I expected a high energy action novel and Beyond the Veil is just that. There is a fight around every corner, and at the scene near the 80% mark–awesomely executed. I felt the action-to-story ratio was a little off for my personal tastes—that is the how and why of 4-stars. All the same, Tim Marquitz has hooked me for one more future read. I hope this review is helpful to whoever found it. If you like a darker story, start with book one—it is still my favorite in the series. Know this journey is daring.